President Donald Trump signed the 2018 Farm Bill in December, officially legalizing industrial hemp — but hemp entrepreneurs fear they’ll still struggle to promote their products. According to two hemp entrepreneurs who spoke with Yahoo Finance, social media companies, search engines and payment processors reject their advertisements, ban their keywords, and strip them of lucrative accounts, while giving major retailers a pass. 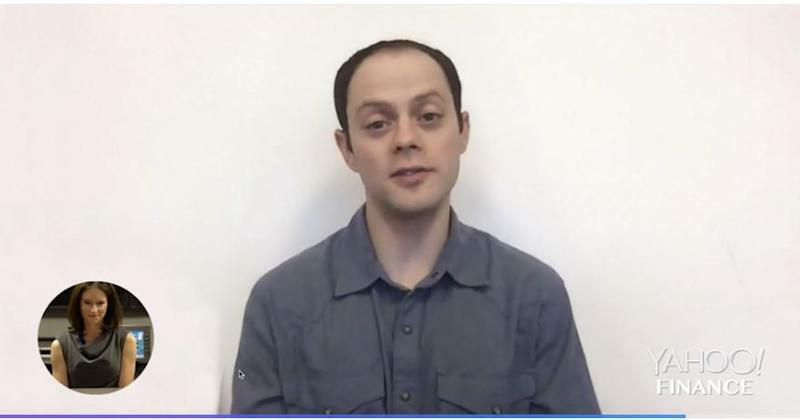 “We’ve been rejected by almost every single digital media company that’s out there, any advertising platform, Facebook (FB), Instagram, Twitter (TWTR), Google (GOOG, GOOGL), Bing, Yahoo, the search engines,” Ari Sherman, founder of Boulder, Colorado-based Evo Hemp, said. Sherman’s company sells THC-free hemp products, including energy bars, seeds, and protein, as well as CBD oil. CBD, or cannabidiol, is a non-psychoactive biochemical found in hemp and marijuana plants, which is distinct from THC, or tetrahydrocannaabinol, the psychoactive biochemical found in marijuana. Both biochemicals are cannabinoids that interact with neurotransmitters, known as the endocannabinoid system. Sherman wants an answer to that question, and he wants to know why big box retailers are allowed to run paid ads for hemp products while his ads are shot down. 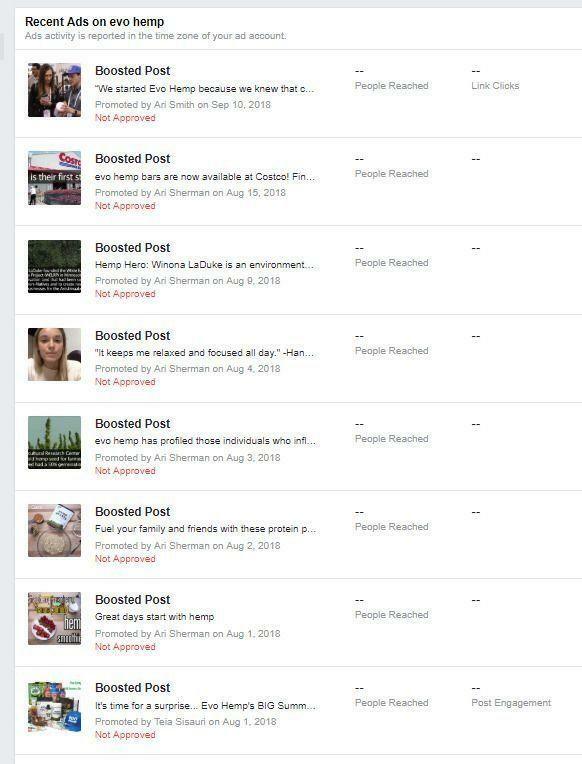 Messaging from Facebook to Evo Hemp rejecting Evo Hemp's requests to boost posts for hemp and CBD products. Brittany Carbone, co-founder and CEO of New York-based hemp company, Tonic, knows hemp advertising struggles well. Her company grows hemp and manufactures CBD oils and dog treats under a state-licensed pilot program. Because of competing federal and state laws, Carbone’s CBD products, unlike Sherman’s energy bars, seeds and protein powders, have a less certain legal status despite industrial hemp legalization. State pilot programs, first authorized by the 2014 Farm Bill, permitted states to oversee growth of industrial hemp plants and plant derivatives for research, so long as THC, the psychoactive biochemical found in both hemp and marijuana cannabis plants, remained below 0.3% concentration. At the same time, cannabis plants and their derivatives remained federally illegal under the Controlled Substances Act, as federal law long failed to differentiate between marijuana and hemp. 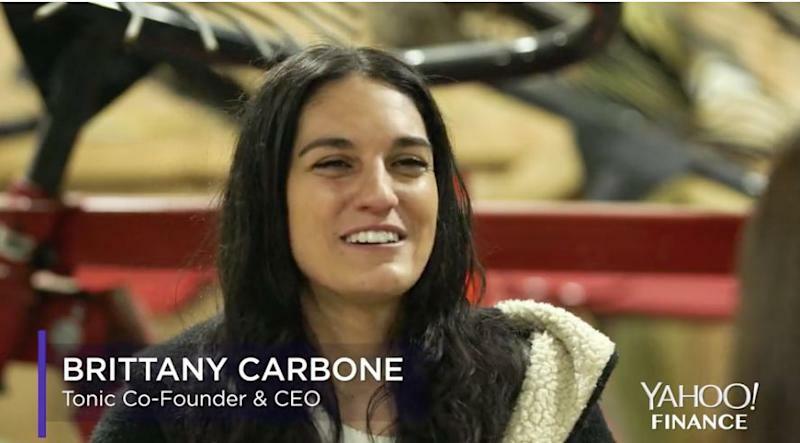 Even with THC levels below 0.3%, CBD proved a tough sell for advertisers, regardless of any rights that producers like Carbone may have had to create products using hemp cultivated in accordance with state rules. “You can make a really strong case that CBD grown and extracted from a state-authorized pilot program is legal,” as of adoption of the 2014 bill, Erica Stark, Executive Director of the National Hemp Association, said. Either way, CBD is under renewed scrutiny. “The catch is that CBD is now subject to FDA approval,” Stark said. With FDA oversight permitted by the 2018 bill, comes the possibility that the agency will categorize CBD as a pharmaceutical drug and therefore subject CBD sellers to pharmaceutical advertising guidelines. 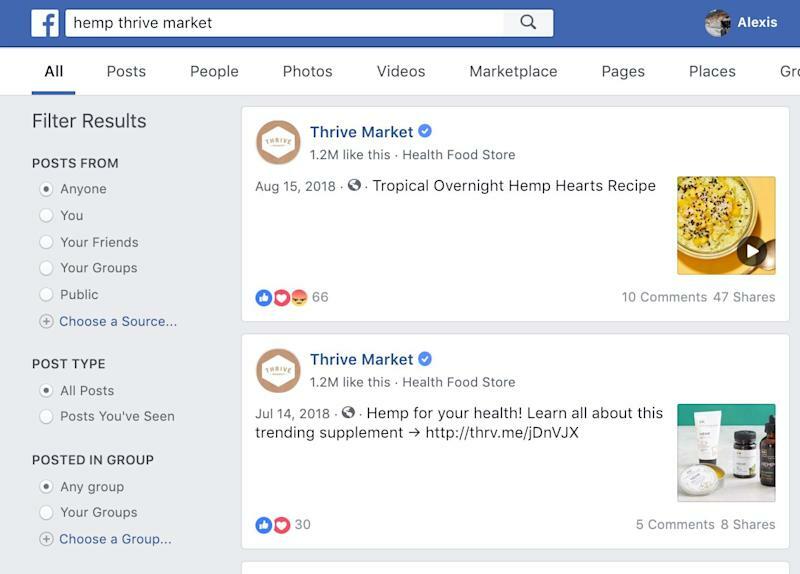 Facebook search generated for "hemp thrive market" shows photos and hyperlinks to Thrive Market post promoting hemp products and linking to product purchase website. In September, the DEA made a minor move recategorizing FDA-approved drugs that contain CBD derived from cannabis and no more than 0.1% THC under schedule 5 of the Controlled Substances Act. Critics say the DEA should tread lightly with CBD because it lacks jurisdiction to regulate the entire cannabis plant. The FDA has not ordered regulatory standards for other CBD products, though FDA Commissioner Scott Gottlieb issued a statement after the 2018 Farm Bill was signed characterizing CBD as an illegal drug ingredient that could not be added to ingestible products without the agency’s permission. No matter what the FDA decides with respect to CBD, hemp sellers want the right to advertise legal products. Any hemp product derived from the plant’s “nonviable” seed has always been legal, Stark explained. Nonviable seeds are those that have been de-hulled and put through heat or other treatment so that they can no longer germinate. 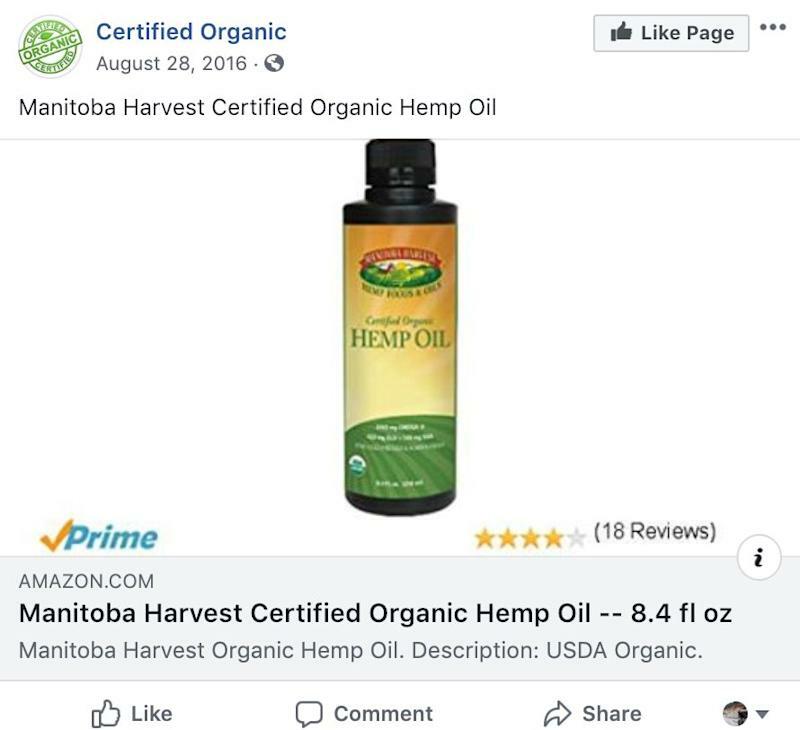 Sherman says Facebook has long been rejecting ads for Evo's legal products including hemp bars, for example, while running similar spots for competitors on Amazon, Whole Foods, Thrive Market, and Manitoba Harvest. 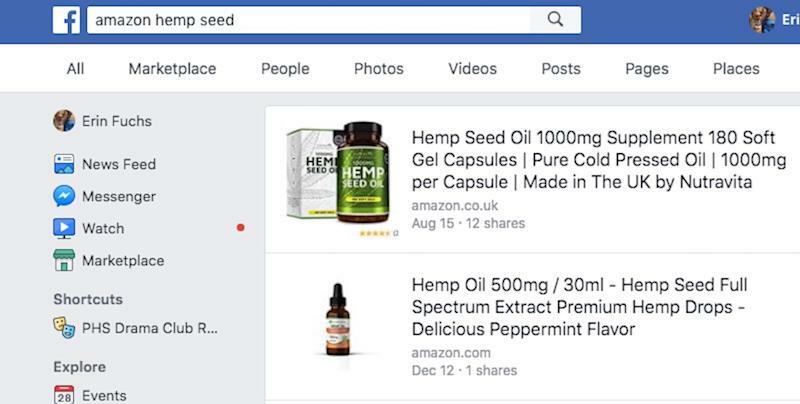 A search on Facebook turns up hemp products that can be purchased on Amazon. “Manitoba Harvest, specifically, they were running a lot of ads — the largest vertically integrated hemp company in the world,” Sherman said. As for Facebook, a spokesperson for the company told Yahoo Finance its Community Standards together with the company’s Advertising Policies prohibit the promotion or sale of ingestible hemp products, regardless of whether they contain cannabidiol or CBD. Non-ingestible hemp products may be advertised so long as they do not contain CBD. That doesn’t explain why Facebook green lights hemp-based product ads submitted by major retailers and rejects those requested by hemp companies. “I got very confused and said, ’So you are allowing them to advertise those hemp products just because their account is so big and they are providing you so much revenue that it’s not worth telling them no?’” Sherman explained. Facebook acknowledged that smaller companies with fewer products may indeed have a more difficult time getting their ads approved on its platforms, including Instagram, because links contained in hemp company ads generally point to web pages focused on a smaller variety of products. Translation: It’s not necessarily what is featured in a paid ad; it’s where an ad takes a Facebook or Instagram user when they click on it. 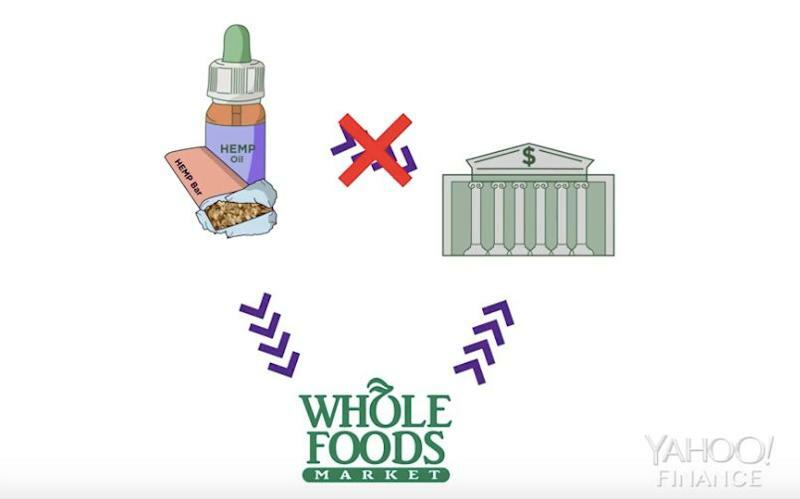 Driving the decision to approve or reject an ad is therefore not based on whether the ad promotes or sells ingestible hemp products, as the policies state. The confusing landscape brings Sherman to a different theory. The suggested “firewall” presents a huge problem for small companies trying to compete. Small companies, just like big retailers, need their ads to point their company website where prospective customers can buy their products. That leaves hemp companies with at least one, prohibitively expensive, workaround. A week’s worth of such ads pairing Evo’s products with other hemp products in a “carousel-type” ad would run Evo about $20,000, according to Sherman. It’s a price the company can’t afford. “We take very small margins, so we have a very small amount of money to put into advertising,” he said. Carbone said in her experience people assume that CBD companies are making it big. Wherever digital advertising platforms decide to draw the line, hemp producers argue that at a minimum, polices shouldn’t discriminate between big retailers and small business. With the 2018 Farm Bill now signed into law and industrial hemp removed from the federal list of controlled substances, hemp companies hope for change. Twitter told Yahoo Finance it expects advertisers to follow FDA regulations that existed prior to the 2018 Farm Bill for food products and hemp-based CBD. The company said it plans to review the new bill and determine if any policy changes are necessary. Sherman said the policies, in Google’s case, are not just a double standard but also hypocritical because the company requested a partnership to offer Evo hemp products to its employees. “It’s just a very hypocritical kind of ridiculous policy that’s in place right now and it’s now kind of spread across the internet,” he said. Yahoo Finance reached out to Google, Paypal, Stripe and Shopify to request information concerning their policies on paid CBD and hemp advertisements, and whether their policies will change with passage of the 2018 Farm Bill. Responses were not received. Yahoo Finance, like Yahoo search, is a subsidiary of Verizon Media / Oath. A spokesperson for the company said, “Our policies prohibit advertising for these products on our platforms."